It's not strange that the overhead door often needs to be balanced. Its balance is determined by the spring and cable system, and over time these parts get loose and need adjustment. When the door is first assembled and the springs are installed, everything is perfectly adjusted. Springs are installed with enough tension to move the door but also keep the door balanced. When the door is balanced, it moves up and down evenly, doesn't sag and closes perfectly on the ground at both sides. Though, with daily use parts cease to be in perfect condition. As a matter of fact, garage door springs lose some tension every single time a full closing/opening door cycle is completed. In order for the door to be balanced, springs must not be too tensed or the door won't close well at both sides. The tension they lose must be added or the springs won't have the power to keep the door open. Let's see how someone can test the balance of the door. For safety reasons, you must first unplug the electric garage door opener and then disengaging it from the door by pulling the emergency release cord. Then you simply have to open the door manually and see if it remains open at any height. When the door moves slightly up, there is too much spring tension and some must be released so that the door can close down well. Such adjustments are usually needed when the door or new springs are first installed or when you try to adjust the springs and see that you have added too much tension. In most cases, you will find that the door slides down and won't stay open and this means that tension must be added. 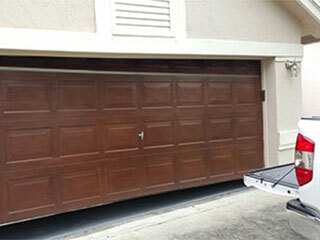 For extension garage door springs, open the door to keep their tension off while the work is done. When the door is open, the pressure of the springs is at minimum levels. If the door was closing down very fast when you were checking its balance, move the spring at each side at the hole farther away from the door! If you noticed that the door opened too quickly, move the springs to the next hole closer to the door. For torsion spring garage door systems, things are more complicated. Torsion springs must be turned ¾ to add tension but there is need to have the right size winding bars. Once you stabilize the shaft with a vise grip so that it won't move, place one winding bar at the cone and loosen the setscrews. Then you will have to use another winding bar to turn the winding cone, remove the first one and turn one more and then take the second winding bar and turn it one more time. The spring coils must be at the right position before you tighten the setscrews again and shouldn't look like a snake or the door would bind. Sometimes, doors need level when the garage door cables are replaced. If the cable is shorter in size or installed with greater tension, the door would sag at this side. You would need to use a screwdriver to release some of their tension from the drum or move the s-hook back or forward in the case of extension springs. The door would need to be checked every single time efforts are made for its adjustment till the right balance is accomplished. It goes without saying that garage door adjustment is a very difficult task. It could also be very dangerous due to the tension of the springs and cables and the heavy weight of the door. For such important reasons, don't hesitate to ask assistance from Garage Door Repair Stillwater for such projects in order for you to know that the job is done correctly, and you are unharmed.